Now that New York Islanders forward John Tavares has one full season under his belt, he has some advice for all those future stars waiting in the wings and counting the minutes to the 2010 Entry Draft, June 25-26 in Los Angeles. "Just enjoy the experience," Tavares told NHL.com. "But make sure you get your rest because there's obviously a lot that comes with the draft and everything you experience after that. It's a long season and, as much fun as it is, you want to make sure you're ready to play every day, enjoy it and take it all in. "But just make sure you're prepared -- it gets tougher and tougher every day." Tavares, the first pick of the 2009 Draft, finished the season tied with Colorado's Matt Duchene for most goals by a rookie in 2009-10 with 24, and was second among rookies with 54 points. His 11 power-play goals led all first-year skaters, as did his 536 faceoff wins and 1,129 chances. His 47.5 percent on draws was second among all rookies. What did he learn his first season on the job? "When I came into camp, I was learning to deal with the size and the strength of the men I was playing against and realized how much time and space they would take away," Tavares said. "Not only that, how strong they come to press you against the glass and the tough battles in the corners -- how they push you off the puck. It's something I think I adjusted to pretty well, but it'll come with maturity and experience. I think I could be even better, although I thought I did hold my own pretty good." To those who have followed the career of Tampa Bay Lightning forward Steven Stamkos, the self-evaluation offered by Tavares may sound familiar. When NHL.com caught up with Stamkos following his first season in the League, the first choice of the 2008 draft admitted he needed to get stronger and faster to compete at the NHL level. He dedicated much of his summer to training with Gary Roberts to fulfill that promise. "I changed up my offseason workout plan and decided to work closely with Gary for 7-8 weeks throughout the summer," Stamkos said at the time. "I wanted to stay in shape and learn from him. I didn't want to bulk up too much because that'll slow you down, but I feel stronger and that's one area I really wanted to improve." Tavares isn't oblivious to the fact Stamkos was a changed player this season in Tampa Bay -- bettering his rookie marks across the board, in games played (82), shots on goal (297), goals (51), assists (44), points (95), plus/minus rating (minus-2), power-play goals (24), shorthanded goals (1) and game-winning goals (5). "We're two different kinds of players, but I think we're both high-profile players coming into the NHL and we both want to keep doing well and improving," Tavares said. "If I can keep improving and keep contributing at a high level, then I think for sure that it'd be great to keep making those strides and get better every single year. "Looking back, I think it's been a really good year. I've learned a lot and experienced a lot and some times were tougher than others, but I think I proved I deserved to be here, so overall it was a pretty good season personally. Of course I'd like to build on that and knowing what I know now, I think it'll be a huge advantage next year." Tavares said he faced Taylor Hall, NHL Central Scouting's No. 2-ranked player on the draft board, a few times in 2008-09 when he played for the Oshawa Generals and London Knights and Hall was with the Windsor Spitfires. He went head-to-head with the No. 1-rated player -- Tyler Seguin of the Plymouth Whalers -- just once. He feels both will be solid contributors to whichever team drafts them. 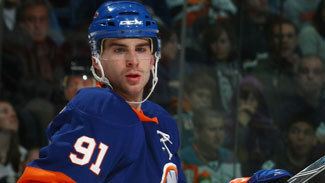 "I just think you have to establish a good balance in becoming a good two-way player," Tavares said. "You want to contribute offensively every night, but making sure I was responsible in my own end and taking care of that side of the puck was just as important, especially over the last month and a half. I think I've flourished in trying to find that good balance and it'll only get better as I mature and gain experience." Tavares feels that so long as today's young players can find that balance in their game, they'll earn the minutes and the respect of their coaches and teammates rather quickly. Although they missed out on the Stanley Cup Playoffs for a third straight season, Tavares feels the Islanders took the necessary steps for what he hopes will be a promising future. The Isles went from 26 wins and 61 points in 2008-09 to 34 wins and 79 points in the 2009-10 season. "Some strides were made," Tavares said. "We would have loved to have been in the playoffs, or at least been a little bit closer than we were, but I think next year will be a good year for us. I think we really want to make a push and really show that we're going to be a team to beat and a tough team to play against in the League." "Garth (Snow, Islanders GM) has done a great job in building our youth," Tavares added. "We should look pretty good next year and I think strong goaltending will definitely help us out. If we can play a little more consistently and keep bringing the work ethic and compete level we bring every night, we'll definitely win some more hockey games." And is there any doubt Tavares will be the centerpiece of that turnaround?